I’m still riding my Tri high a couple of weeks after the race! 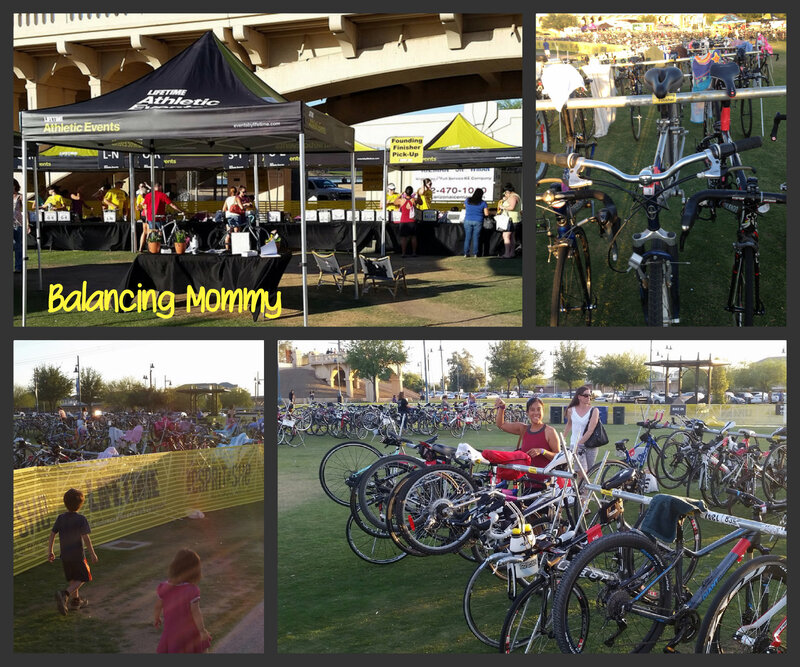 Due to our family schedule, I made it to the packet pickup and bike drop off around 5:45pm. As a Founding Finisher (I ran the Esprit de She 5k last year), I was eligible for a few perks like special check in area and a separate transition area. I picked up my packet (super easy) and took my bike over to the transition area. I loved the Founding Finishers transition area; it was close to the Bike Out/Bike In area and the transition area potties. Founding Finishers pick their own spots in transition! Since I arrived late, it took a little while to find the perfect area. By that point, I wished the Founding Finishers’ area was numbered so that the decision was made for me. 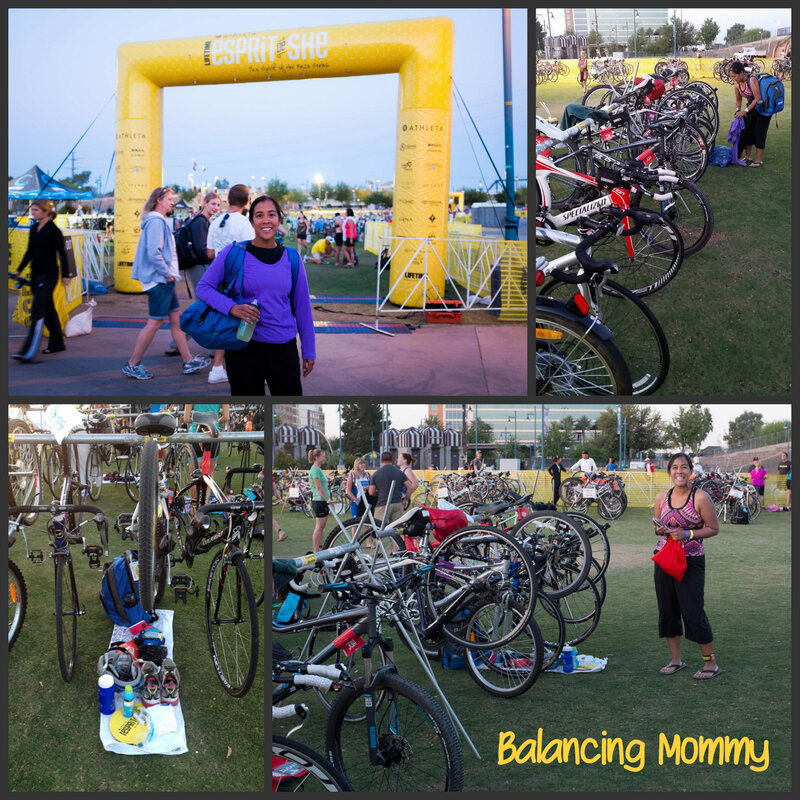 Everything was labeled with cute Founding Finisher stickers, but I was overwhelmed! I was a little late, but I made it to the course talk and I’m so glad I stayed. It was very helpful! The announcer and course supervisors outlined each part of the race very clearly. It was good to know that there would be no support along the bike course. I made a mental note to add a hydration bottle to my bike. I also learned that when racking your bike, the number (or sticker) should be visible below the seat. After dinner, we arrived home and I practiced my transition one last time before I packed it all away. I was too excited and I didn’t get much sleep, so I woke up before my alarm went off. My husband came along for moral support and to be my race day photographer. He took some great pictures; I absolutely love the picture at the top of this post. I re-racked my bike to match everyone else’s set up. In reality, transition area is about half the size of a beach towel. There really isn’t anywhere to sit down. Some people recommend to bring a utility bucket from Home Depot or Lowes. That way you have a spot to sit on when you’re putting on your shoes. If you could get everything into the bucket, I would see bringing one instead of a backpack. There’s just not much space for anything. Coach Cathy discouraged the buckets in order to conserve space. I’m so glad that I was close to the transition potties. This area was also stocked with snacks, water, and emergency supplies. Thankfully I didn’t need anything, but it was good to know that it was there! From Esprit de She Facebook. “Be funny” she said. I look goofy but was feeling terrified! I had so much nervous energy, I didn’t want to stay too long in the transition area. Hubby and I went down to the start line so that I could make peace with the lake before it was time to get in. On the way there, we grabbed a few pictures with friends (some brand new via SBM Army) and I raised my hand to be recognized as a first timer! After the national anthem and opening remarks, it was go time. 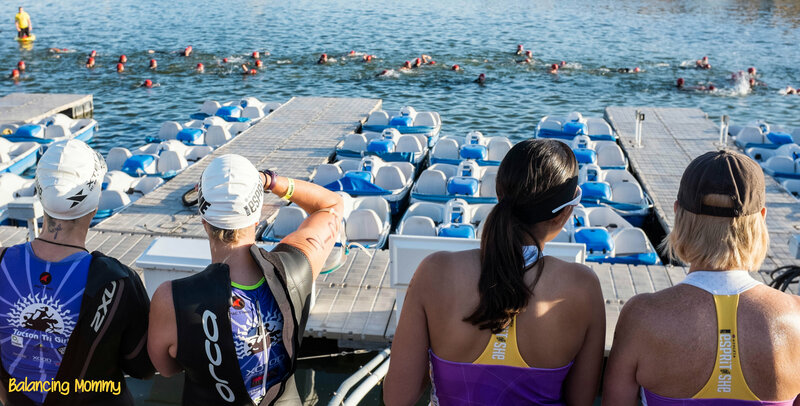 Each wave started with a little warm up swim to the start line. I nervously watched all the other distances swim to the start line and wait. The picture at the top of this post shows the International/Olympic distance swimmers after their start. The International/Olympic distance waves went first, followed by the Sprint distance and finally the Super Sprint. Each distance had about 3 waves. I was in the Buddy Wave, so I was in the very last wave to go in the water. Some of the International and Sprint girls were already coming back by the time my wave was jumping in. I turned on my watch as our wave was called. When I jumped into the water, I was just a little too enthusiastic and I touched the bottom of lake. This set off some internal panic, by the time I was hitting the surface, other girls in my wave also started to jump into the lake. This made for an anxious entry and warm up. I rested on my back until it was time to start. Even though I had the open water swim a few days prior, I still panicked at the start of the swim. I went out too fast and had to swim on my back for a little bit. I also veered off course a few times. I tried to do the swim in chunks. I did my best trying to follow the buoys and the lifeguards that were nearby. Thanks goodness for Kelsy and Emil! Kelsy helped me through the first half of the course and Emil got me through to the finish. I didn’t do a good job of slowing down my swim or my breathing and I also kept getting water in my goggles. So I rested on the kayaks (Kelsy) and paddleboards (Emil) a few times. By the time I made it to the last turn, I thought I was home free. I swam on my back for a little bit and was disoriented. Thankfully, there were awesome swimmers, in the Olympic and Sprint waves who offered to help. 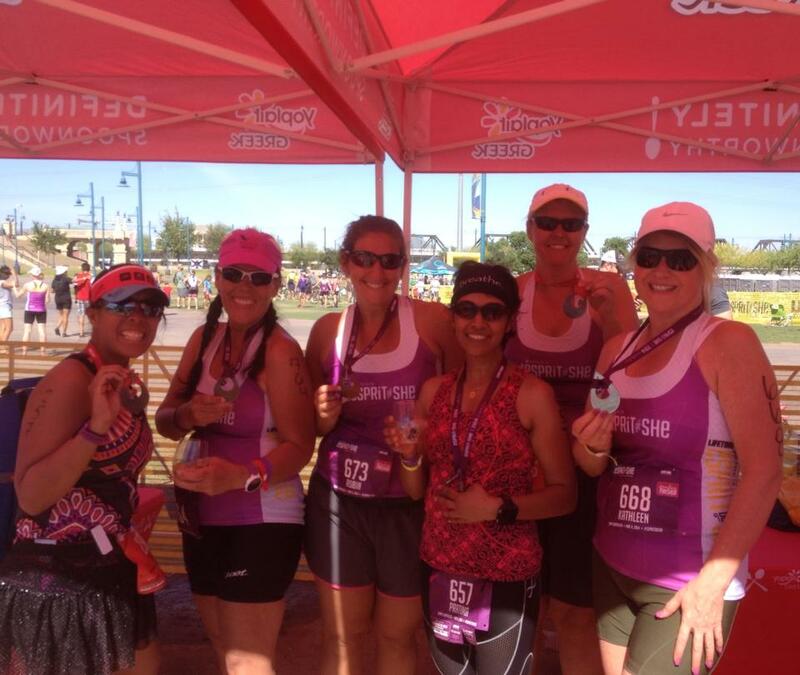 This is why I wanted the Esprit de She to be my first Tri, the support and camaraderie is there every step of the way. I just needed a voice telling me which direction to go and a little rest to catch my breath 25 yds away from the climb out. Once I approached the steps and saw my hubby, I had the ugly cry of relief as I was getting out of the water. I was so ecstatic that the swim was over, I kept saying “I did it!” to all the volunteers. Once I got my bearings, I was goofy and slap happy as I ran to transition. I remembered to stop the swim part of my watch. I rinsed my feet to remove as much grass as possible and decided to forego the socks. I put on my sunglasses and helmet and I ran out of there as quickly as I could with the bike. The mount area was clearly defined, and it was time to ride! I remembered to switch my watch on just after the start of he bike course. Thankfully, the GPS connected quickly and I was able to record my ride. Compared to the swim, the bike was downright enjoyable. My sister in law let me borrow her hybrid mountain bike, so I’ve had a few months of practice on it, but this was the first time I was really getting to bike! The bike was race ready, the tires actually had enough air and I was full of adrenaline and excitement from actually finishing the swim, that I flew in a couple of spots along the ride. I wasn’t planning on passing anyone, but I was cruising along at a good pace. I cheered for all the ladies that were flying by me. 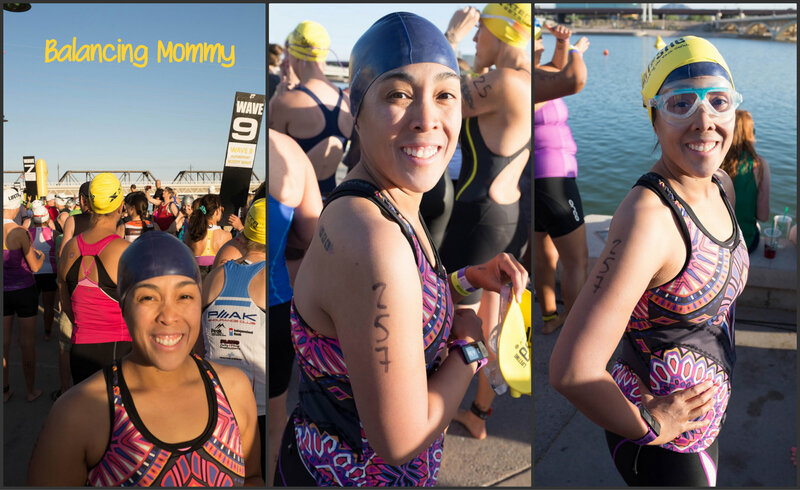 I saw a couple of the ladies I met at the swim on Thursday and via Swim Bike Mom. They were rocking the bike course! I saw my hubby twice on the bike course and I was so happy to see him. I was sure that something would happen on the bike, thankfully it was uneventful. I’m glad that I practiced drinking on the bike, as it does take some skill. 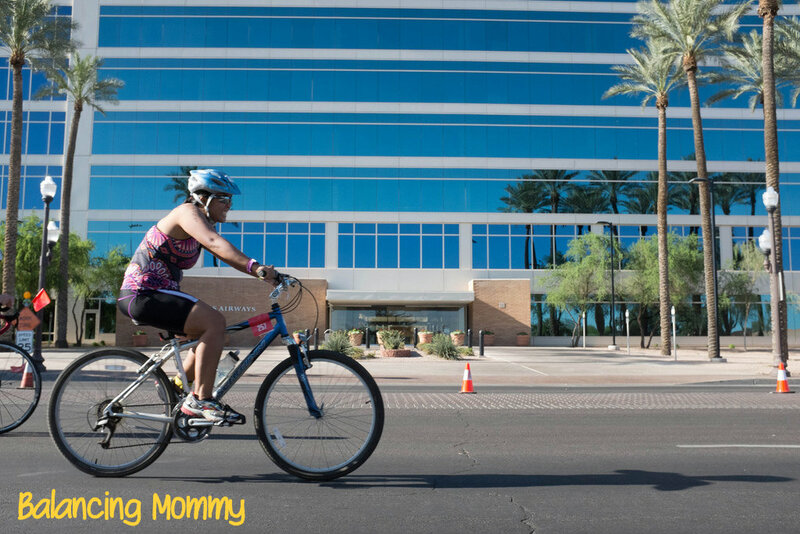 A couple of times during the ride, I was just joyful at the realization that I was doing a triathlon and I was going to finish! I managed to dismount without any issue, turn off the bike segment on my watch, rack my bike and get my gear for the run. I switched my helmet for my visor, put on my race belt, and grabbed the water bottle. I ran as fast as my legs would take me and I thanked all the volunteers along the course. The GPS took a little while to connect, and it was ready just after the start. The way out was pretty flat, but the way back had rolling hills. At one point I broke out into song, “the hills are alive with the sound of music” and gave myself the giggles. 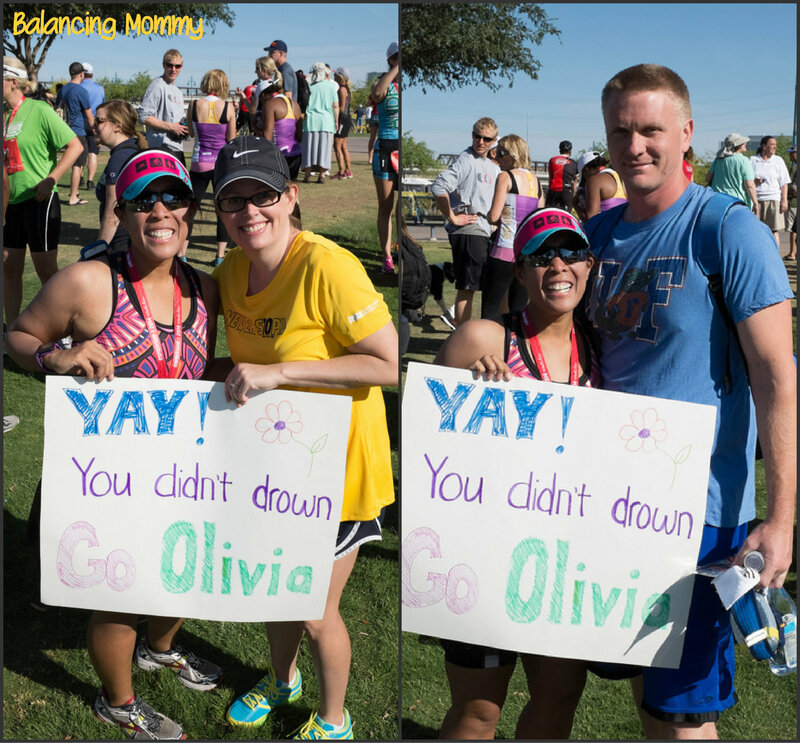 When we made the turn for the finish, I saw that my running buddy came to cheer me on complete with a great sign! Of course, I was emotional as I crossed the finish line. Finish line pictures. I’m waiting for Chronotrack to release the pictures for purchase. The mimosas were my favorite after race treat. I didn’t do the massages or the salon treatments, but they looked fun! I had some yogurt and a scramble (rice, turkey and eggs) that was tasty. 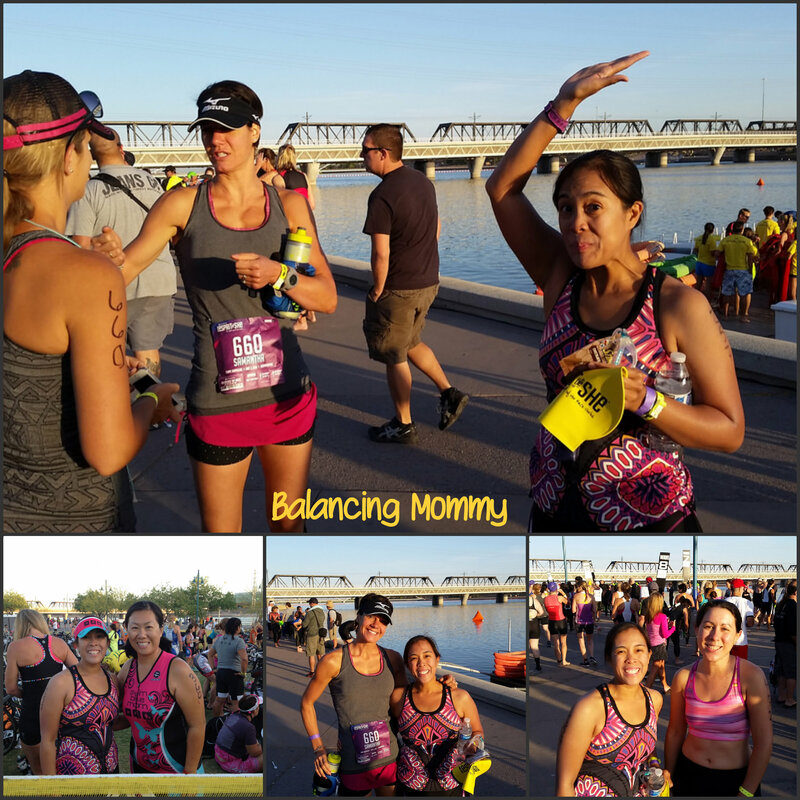 I got a chance to catch up with the MRTT ladies and hear about the day’s adventures. Everyone was cheerful and had a really good race. I’ve been bitten by the tri bug, so I’m shopping for upcoming triathlons in the area. Right now, I’m sticking to pool swims for the time being. My OWS needs a lot of work before I can comfortably move up in distance. 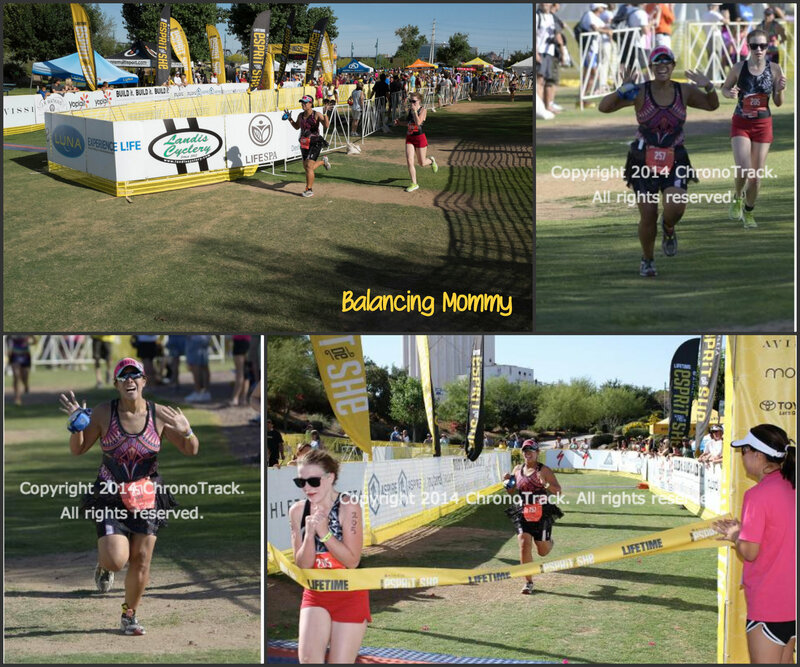 Looking at timing, I see that I totally rocked the transitions for my first triathlon! I also was faster on the bike than I anticipated. I’m already looking forward to next year’s Esprit de She triathlon. Disclaimer: I’m an Esprit de She Ambassador. 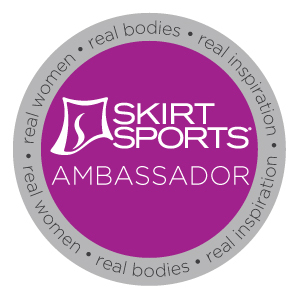 I was selected to be an ambassador after I registered for the 2014 Super Sprint Triathlon and the 5k (coming in October 2014). All experiences and opinions are my own. 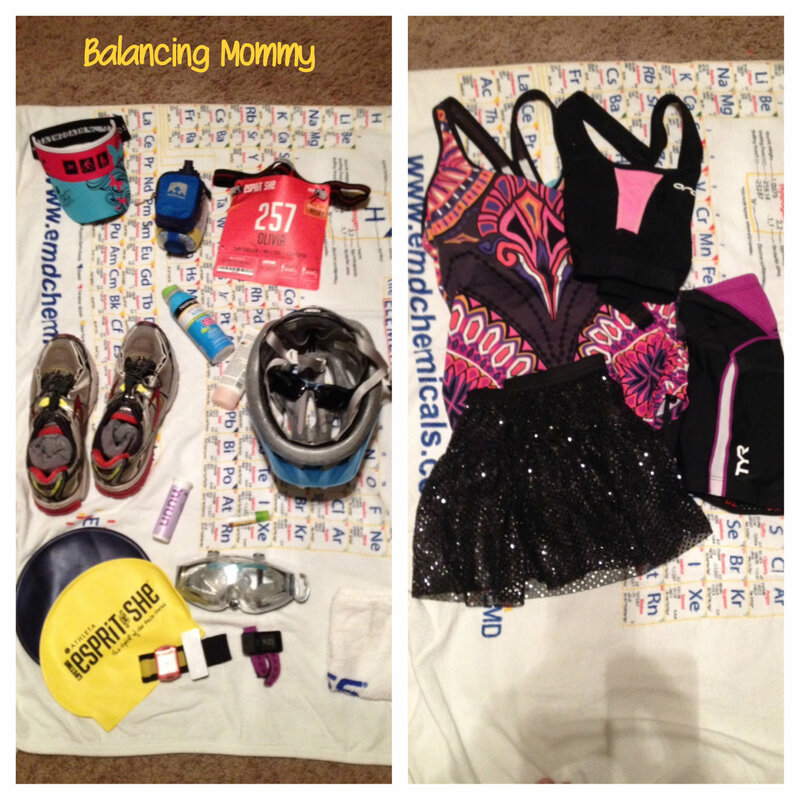 Posted in Goals, Races, Triathlon, UncategorizedBookmark the permalink.